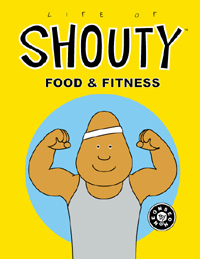 This is the second book in the Life of Shouty series. (You can read our review of the first book Good Habits here.) Once again, Shouty Mack's life is not going well. He is overweight because he is not eating right and not exercising. This book is also written in rhyme with simple illustrations. The book's message is a good one. If we take care of our bodies and are determined to stick with what we must do—that is, reject junk food and start adopting an active lifestyle, we will be healthy. But again, my kids thought this book was just okay. The writing style was difficult to understand at times, and it seemed like the author was just using certain words so the text could rhyme. We had to read this one several times. It almost sounds Shakespearean. So drastic a change filled Shouty with sorrow. He'll waffle and wane when tempted tomorrow. Shouty Mack, from which this book is based, was initially a comic strip for a high school newspaper, Once again, my kids and I feel that it would have needed to be modified to suit its audience. They really couldn't relate to Shouty's dilemma and the illustrations were unexciting. It's too bad since the book has a good message. What a shame about the writing style! It seems like a message kids should be receiving!